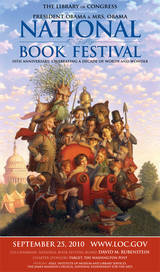 The 10th annual National Book Festival, organized and sponsored by the Library of Congress, will be held on Saturday, Sept. 25, 2010, on the National Mall in Washington, D.C. More than 70 authors, illustrators and poets will be in attendance to discuss their work. Brad Meltzer (@bradmeltzer) and Neil Gaiman (@neilhimself) have tweeted about the vote, so I’m surprised to see that Diana Gabaldon is beating them both. If you would like to see your favorite author higher up on the list, head on over to The Library of Congress’ National Book Festival page and vote! Also feel free to share your vote here as well in our very own poll.